Rube Waddell (October 13, 1876 – April 1, 1914) is one of baseball’s all-time great characters. But unlike many of baseball’s other great, wacky characters (such as Mark “The Bird” Fidrych, Jose Lima, and Al “Mad Hungarian” Hrabosky), Rube Waddell has gone down in history as one of the game’s all-time greats. 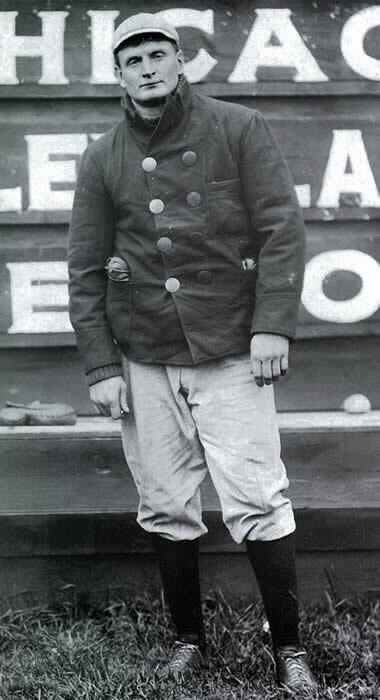 Rube Waddell sporting a large-buttoned jacket, and looking far too serious. Nicknamed “Rube” due to his big size and hayseed-like appearance, Waddell amassed an impressive 193-143 career line to go with an absolutely sparkling 2.16 career ERA. He won the American League pitching Triple Crown (leading the league in wins, ERA, and strikeouts) in 1905, and led the AL in strikeouts for six straight years, from 1902-1907. His pitching greatness eventually led to a well-deserved induction into baseball’s Hall of Fame in 1946. But it is for his non-pitching exploits for which Waddell may be best remembered. Ahh, where to begin… well, for starters, Waddell performed as an alligator wrestler in the offseason. Somehow, I don’t think that would go over too well with team ownership these days. He also had a tendency to leave the dugout during games to follow passing fire trucks to fires, and was often distracted by opposing teams’ fans, who would hold up puppies and shiny objects to put Rube in a trance on the mound. Rube, a life-long alcoholic, spent his entire first signing bonus on a drinking binge, leading the Sporting News to dub the left-handed throwing Waddell “the sousepaw.” Not surprisingly, Waddell’s peculiarities led to frequent spats with teammates and coaches. In one notable instance – which was covered in detail on this blog by Dave – Rube’s teammate (and bedmate) Ossee Schreckengost refused to sign his 1903 Philadelphia A’s contract unless team management promised that Rube would not eat animal crackers in bed. Rube, a big fan of the midnight snack, also liked to eat limburger cheese sandwiches in bed. Somehow, I can’t picture today’s ballplayers eating limburger cheese sandwiches and animal crackers in the wee hours of the morning. Schreckengost signed the 1903 contract, but whether Rube complied with the no-cracker-order is unknown. It is also unknown whether he preferred elephants or giraffes. Fittingly, Rube Waddell died at the age of 37 on April Fools’ Day. What a guy! Screw Wheaties! Rube started his days off in style with some tasty animal crackers. This entry was posted in funny names in baseball. Bookmark the permalink. My favorite Rube Waddell story is bases loaded, no outs, and he instructs fielders to sit down because he’s going to strike out the next three …. and does. Haha, I love stories like that! Called shots always make for enjoyable stories, but for some reason, I think Rube Waddell wasn’t bluffing. He actually was convinced that the best strategy was for his fielders to sit down. We generally use Wikipedia as a base for our research, but I’ve read about Rube Waddell in several books. The midnight snack story came from a book referenced by Dave in his Ossee Schreckengost post. It’s a great post, you should check it out! Like a lot of baseball fans, I’d heard of Waddell but had no idea he was that much of an outlier. The tiger doesn’t look particularly like a tiger. 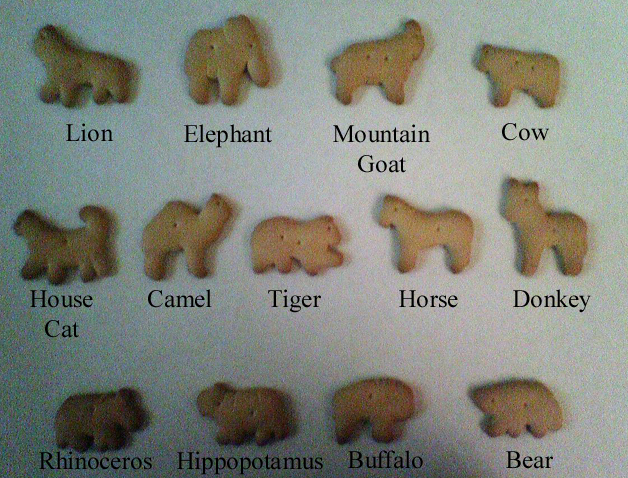 Hmm, got distracted by animal crackers. What a guy! Maybe I’m too obsessed with that picture of the crackers, but is that “hippopotamus” not clearly a rabbit? I mean, come on. I’ve decided that Thursdays are now “Funny Names from the Vault” days, where we repost some of our favorite posts from yesteryear. This guy is one of my all-time favorite baseball characters, and still brings us animal-cracker-related search results every now and then. His surname was Waddell AND he died on April Fool’s Day? The man’s a legend.